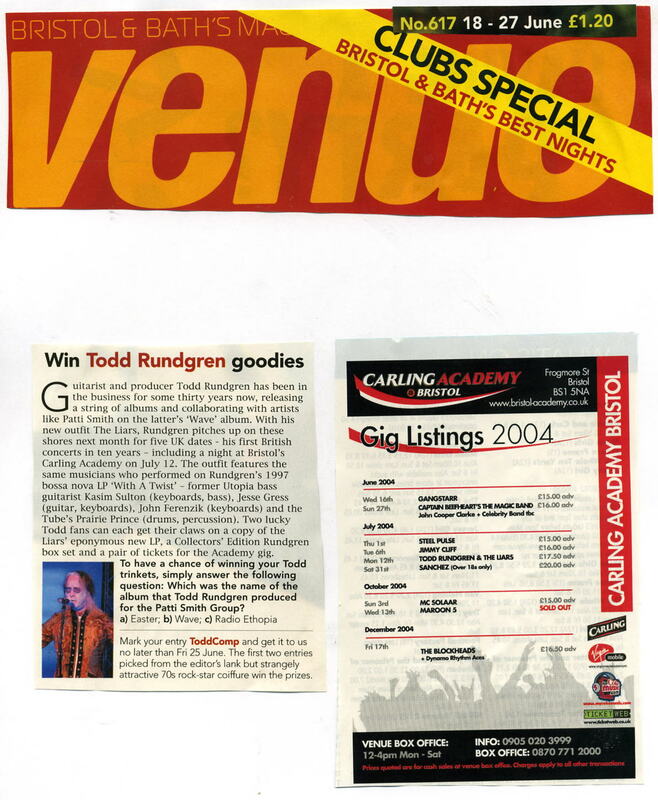 Includes Rare Performance Of George Harrison's "While My Guitar Gently Weeps"
Sanctuary Visual Entertainment UK is pleased to announce the Monday January 30th 2006 release of Todd Rundgren Liars Live, the state-of-the-art concert DVD - produced, edited and mixed by in 5.1 Surround Sound by legendary singer/songwriter, Todd Rundgren. Liars Live was filmed in concert on June 9th, 2004 at 'The Empire Centre at The Egg' (aka The Centre For Performing Arts) in Albany, New York, and features two hours' worth of material totaling eighteen songs; eight taken from his critically acclaimed 2004 Liars album, including 'Soul Brother' and a haunting cover of George Harrison's 'While My Guitar Gently Weeps', both of which also appear on newly released 'Best Of Todd Rundgren Live' album. The DVD includes an additional 40 minutes worth of special bonus features including a scrapbook and an exclusive Video Diary filmed on location during the Liars' Japanese leg of the tour. The Oregonian's TOP 10: The year's best in pop and jazz. 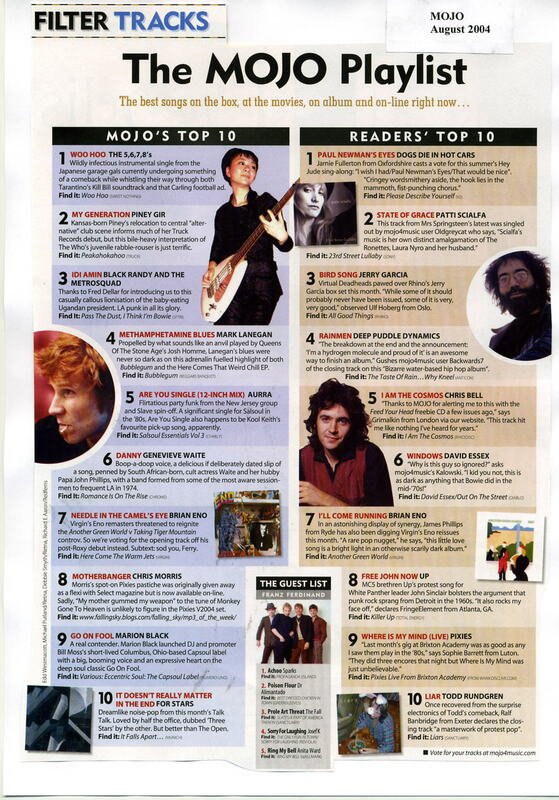 "Stood Up" recently made #29 on WTMD's (Towson,MD) top 89 songs of the year. 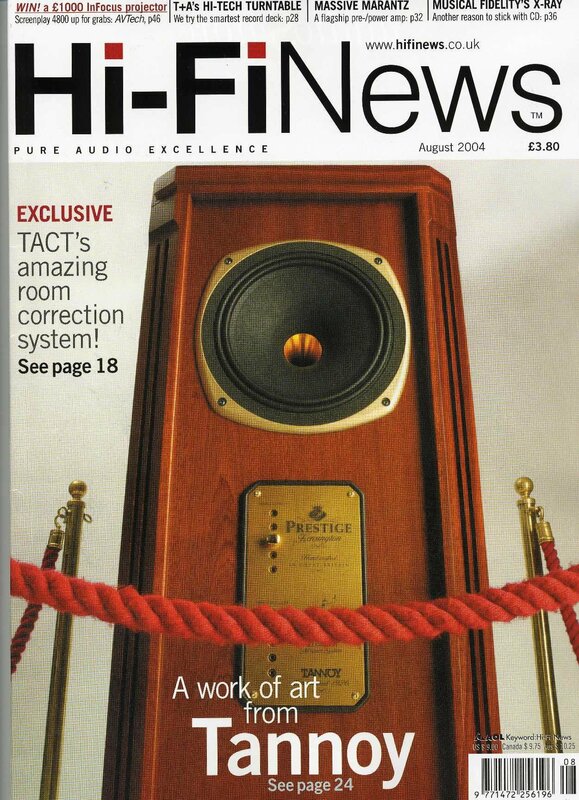 For you gearheads out there interested in the technical aspects of Todd's Liars touring equipment, look no further than the October 2004 issue of Front of House and the article by Bill Evans, Todd Rundgren and the Liars: A Triumph of Cobbled-Together High Tech. 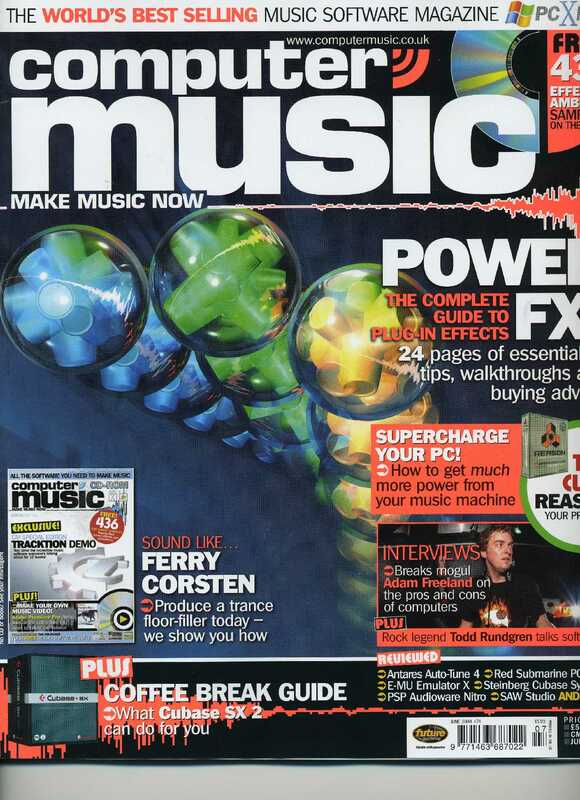 For scans from the magazine itself, see Page 1, Page 2. 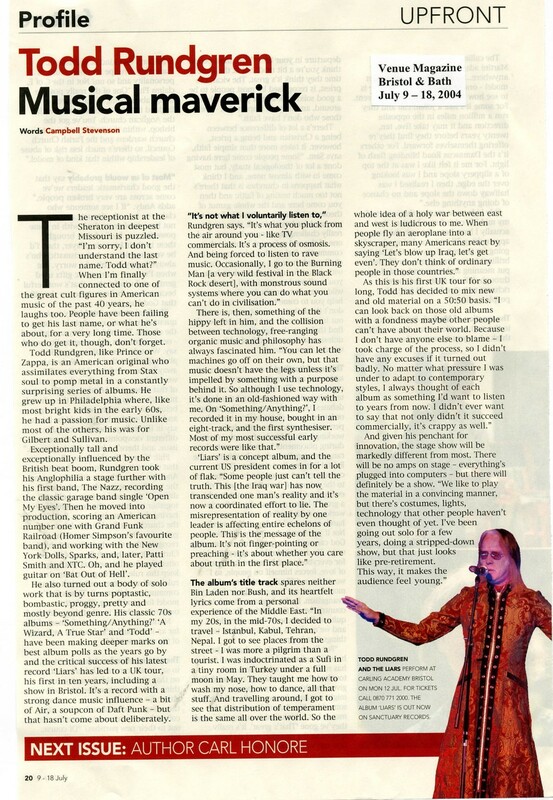 Special thanks to Darnelle Corbett for the article. 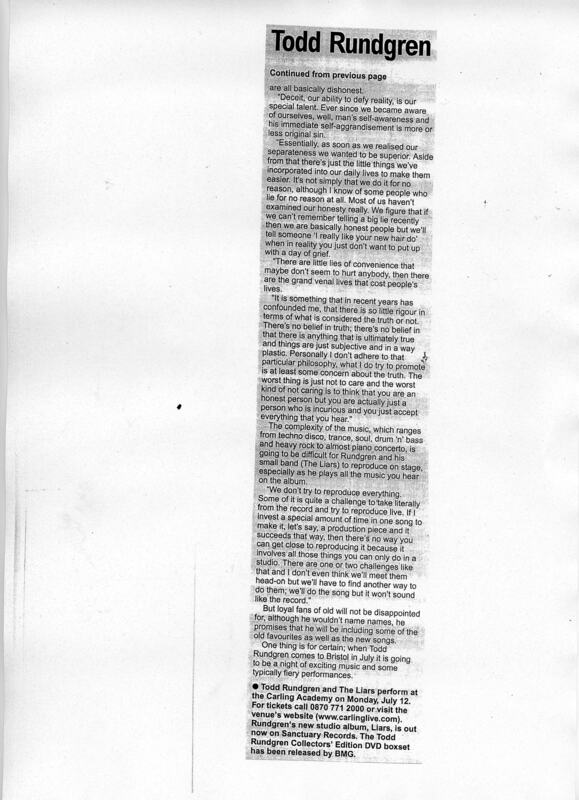 Press coverage from the Portland Tribune. 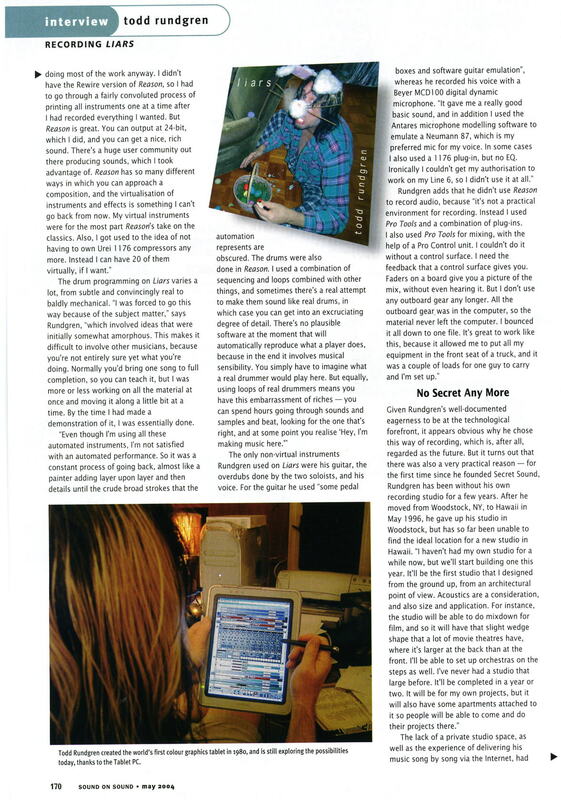 An extremely detailed and informative technology article about the production that goes into the Liar's tour. 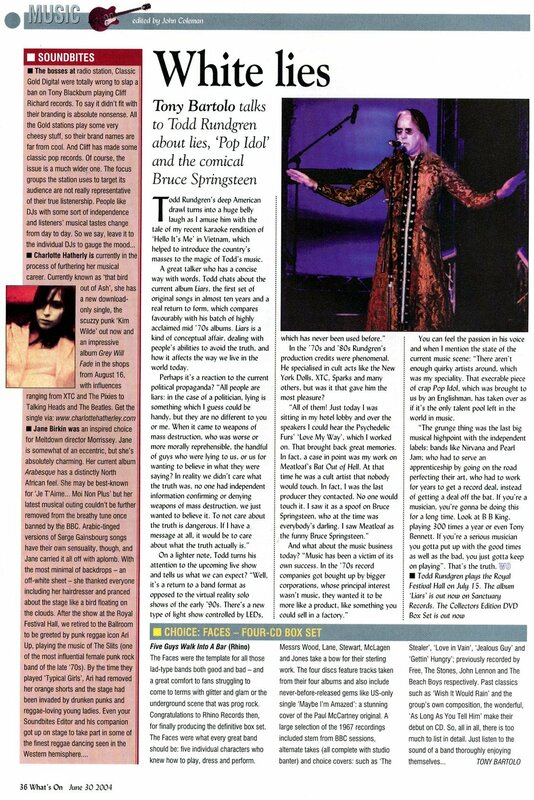 Scanned concert reviews from the UK - Financial Times, The Observer The Independent on Sunday, The Sunday Express, The Times and finally, Todd Rundgren's "Liars" album is voted in the Top 10 Best Albums in this month's reader's poll in Mojo magazine. 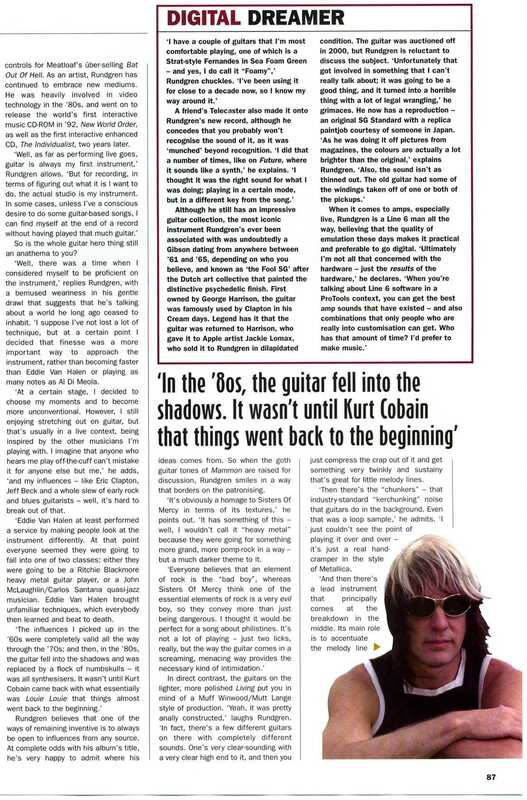 Venue magazine in Bristol just published this full page interview with Todd Rundgren. 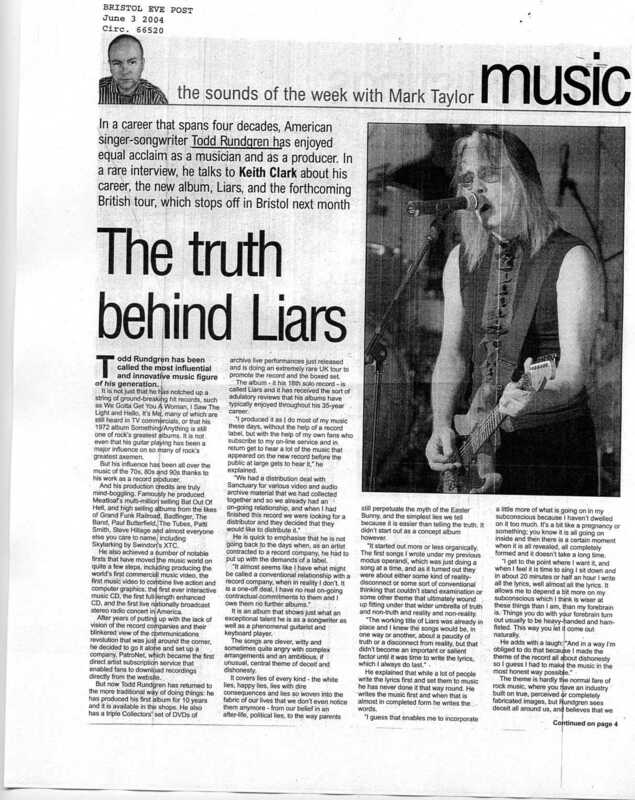 The interview was done by Campbell Stevenson, who originally reviewed the "Liars" album for the Observer newspa per in the UK back in April. 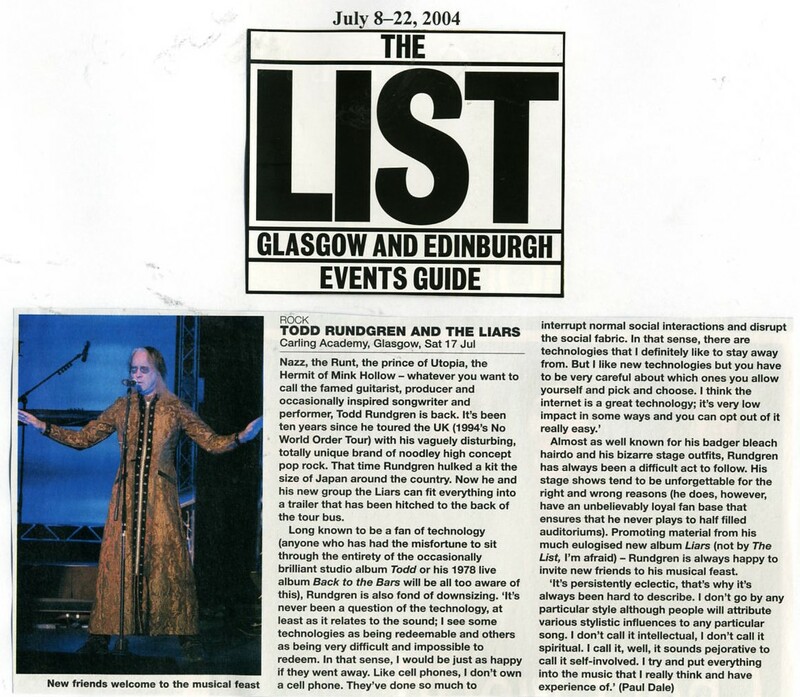 An interview with Todd that was just published in The List magazine in Glasgow and Edinburgh. 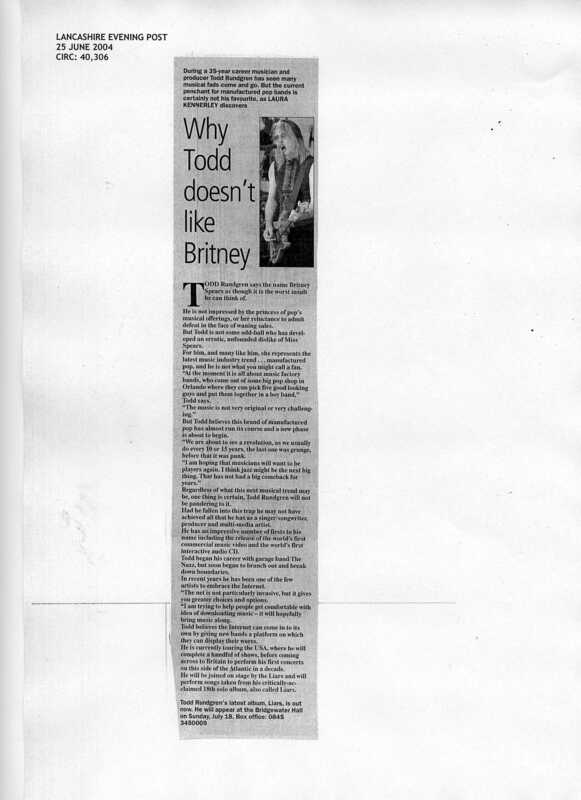 A preview of Todd's tour published in the Wolverhampton Express and Star on July 2nd. Fan alert! 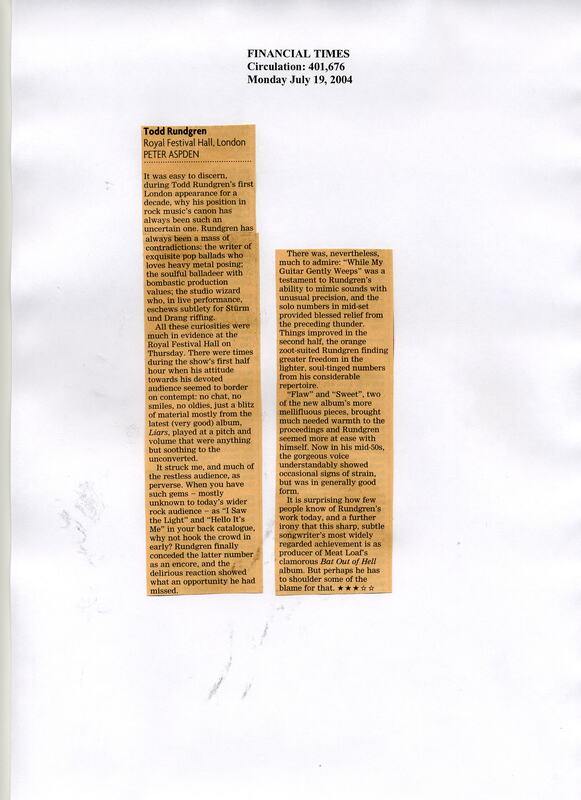 - Todd is being interviewed in Amsterdam today by British journalist Tony Quinn. 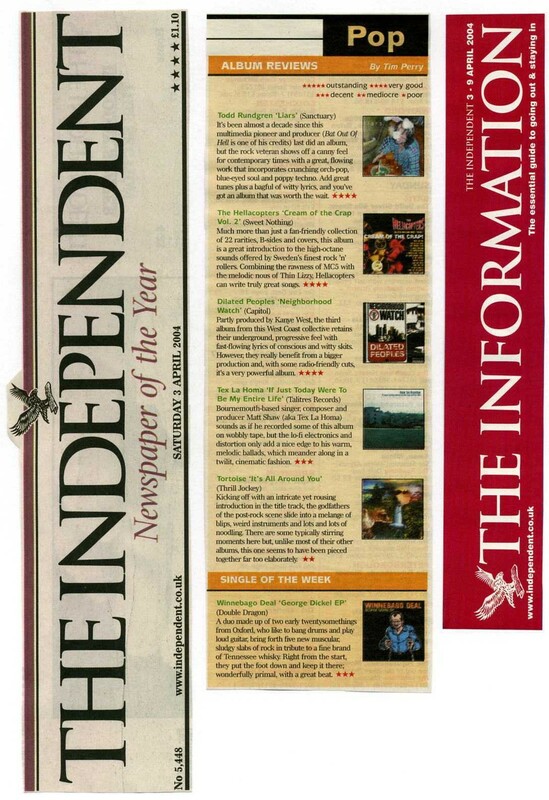 The interview will be published in the Independent newspaper in the UK on Wednesday July 14th. 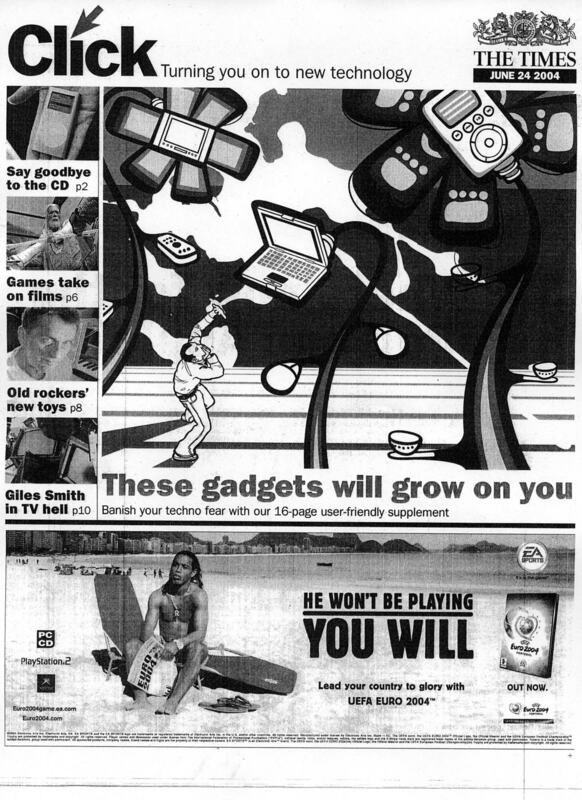 It's going to be a major two-page colour feature and for those of you who c an't buy an original copy of the paper, click on to the Independent newspaper's website, as the feature/interview will be online in the entertainment section at 7am on Wednesday July 14th onwards - www.independent.co.uk. 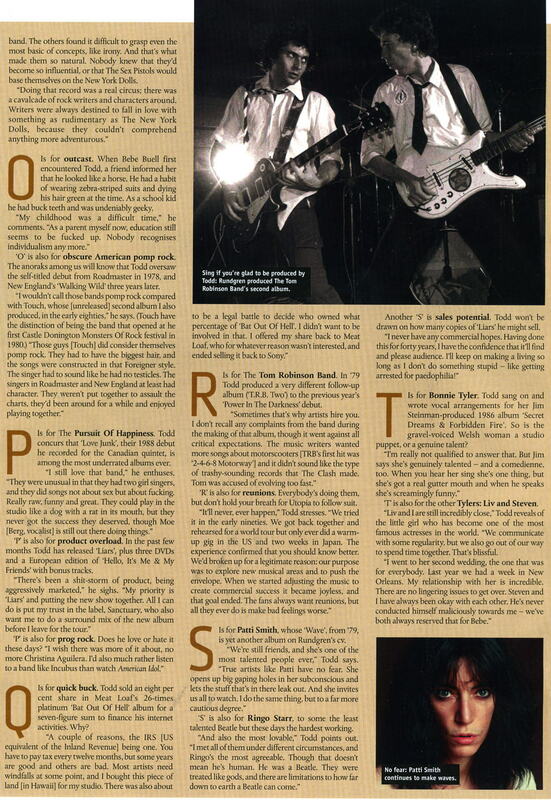 [Updtd annoncement with photos and TRB CD re-relase info] Twenty-five years after Todd Rundgren produced the Tom Robinson Band's second studio album, "T.R.B. 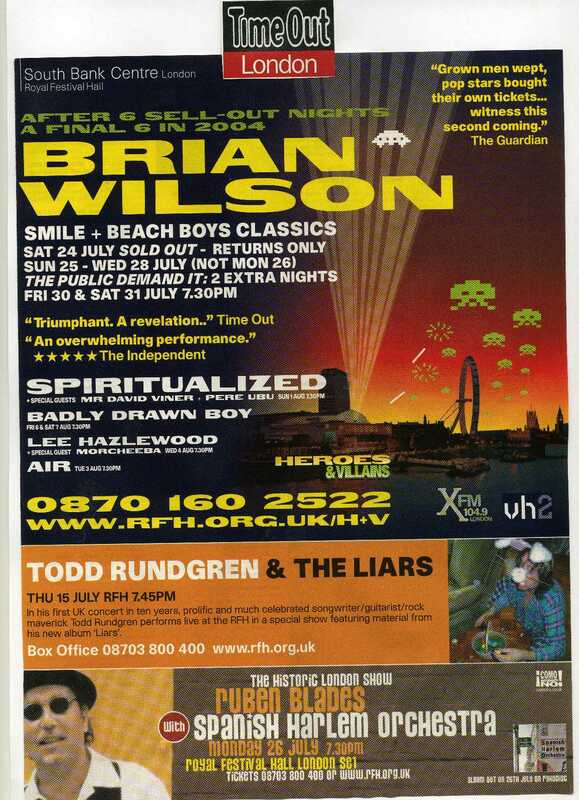 Two", Rundgren and Tom Robinson will be reunited in London, England at BBC 6 Music digital radio on Thursday July 15, 2004. 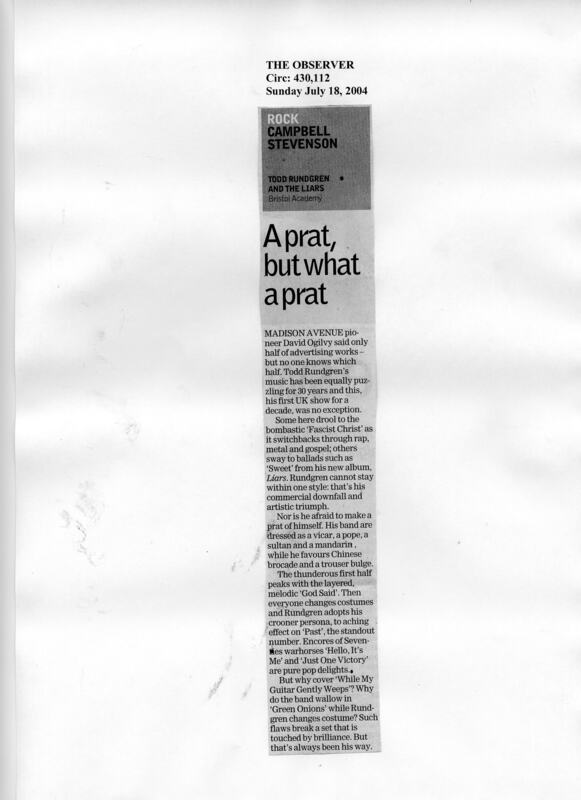 Birmingham Evening Mail newspaper. 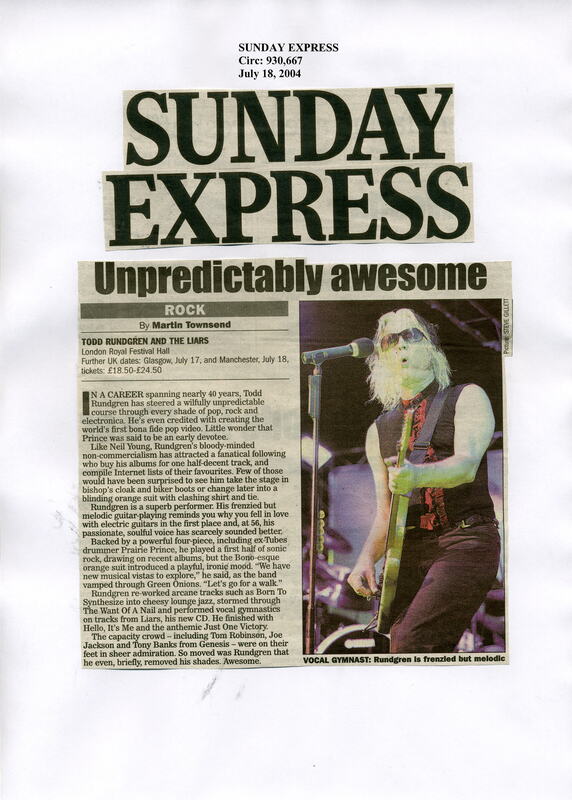 It's a preview of TR's forthcoming concert at the Birmingham Symphony Hall in the UK on Wednesday July 14th, 2004. 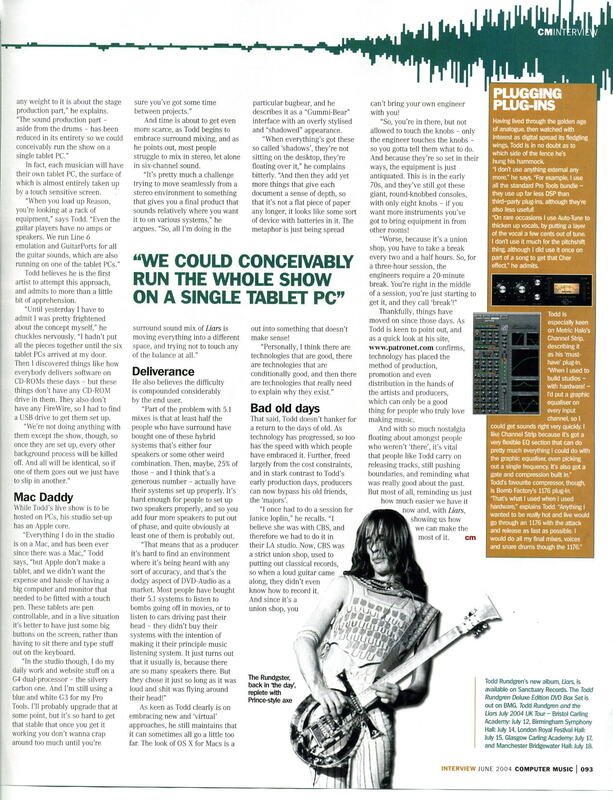 Todd Rundgren is included on page three of the Times Newspaper's "Click It" Technology computer supplement. 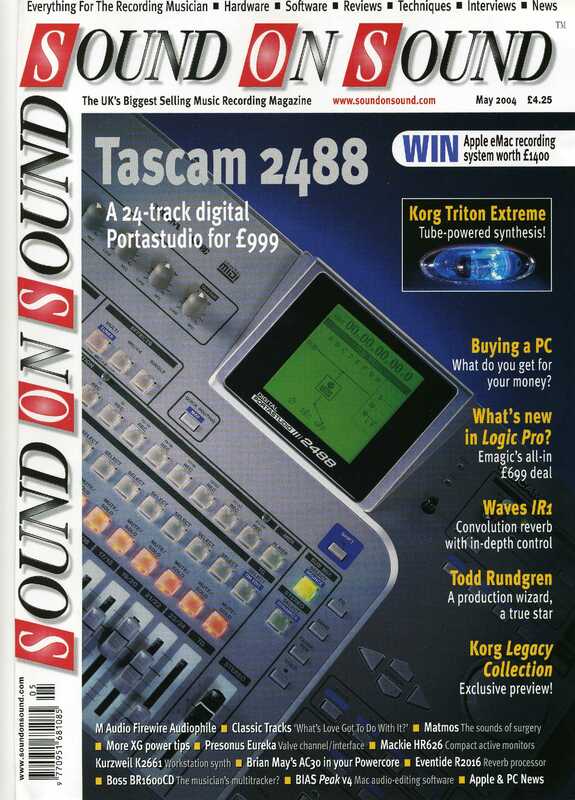 Page 1 2 3. 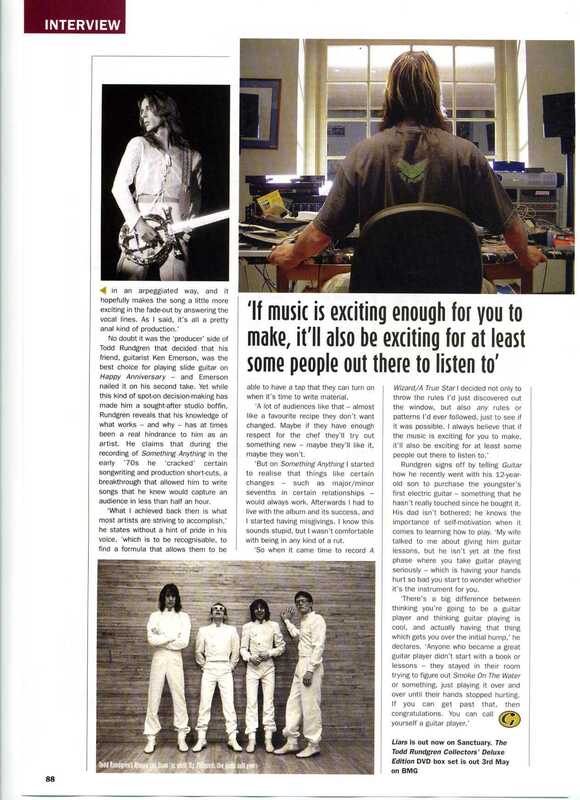 This feature/interview is a preview for the Birmingham concert on Wednesday July 17th at the prestigious Birmingham Symphony Hall. 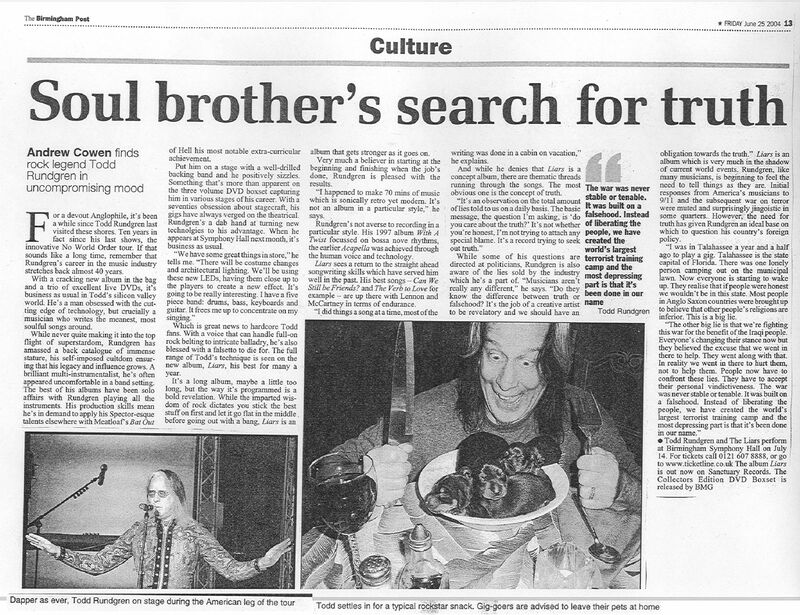 Todd Rundgren was interviewed for the Lancashire Evening Post in England on June 25. 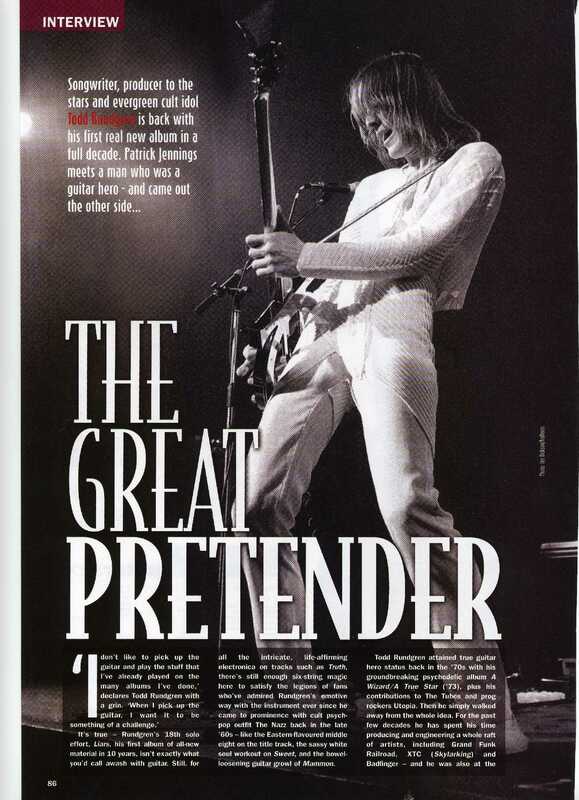 Here's a full page ad for TR's London gig that was just published in this week's Time Out magazine. 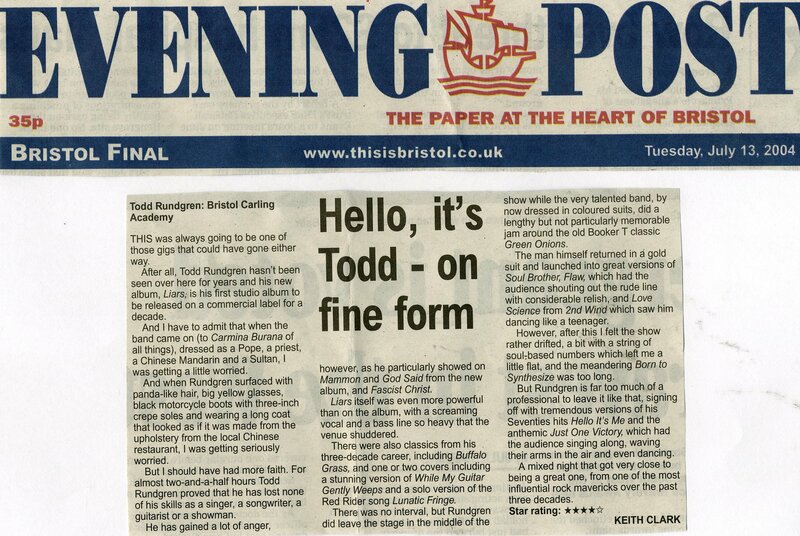 Here's a Todd competition and concert ad in this week's Venue Magazine (Bristol). 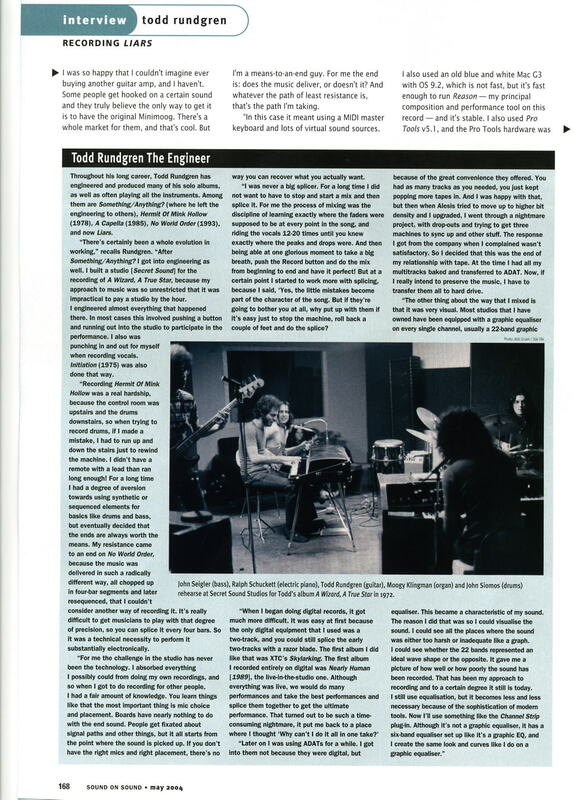 Three of Todd's US gigs have just been reviewed by Paul Lester in the new July 2004 edition of UNCUT. 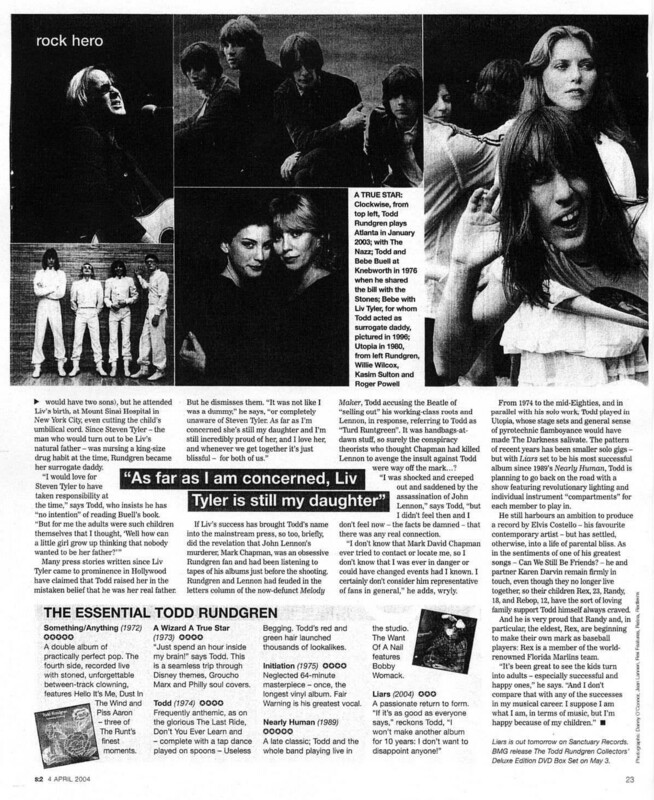 In the Times newspaper, a feature about the seminal pop group Sparks, who, are performing as part of Morrissey's Meltdown music festival at London's Royal Festival Hall. 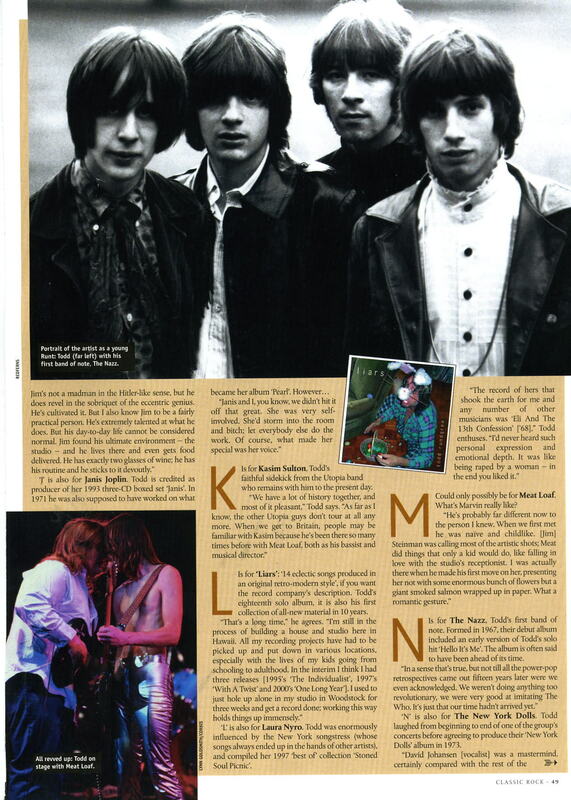 If you go to the second paragraph, there is a reference to TR as Sparks first record producer in the guise of "the eccentric rabbit-boy Todd Rundgren." 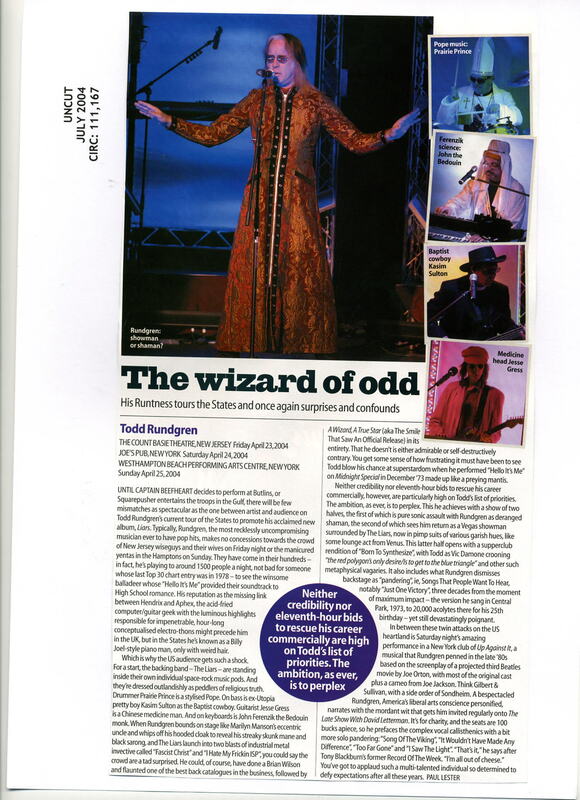 Mojo features a new photo of Todd on his current US tour as the lead image on their concert listing page (out this weekend). 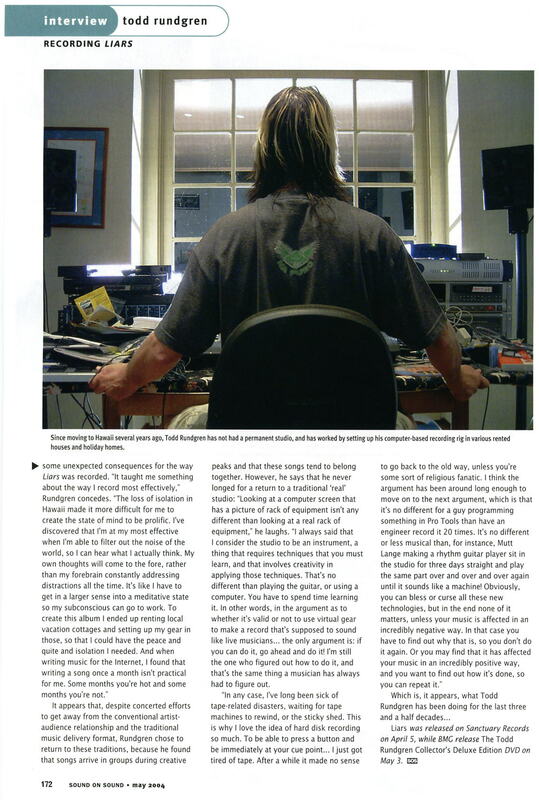 Hi-Fi Choice magazine have just published a double page spread interview with TR about music and technology. 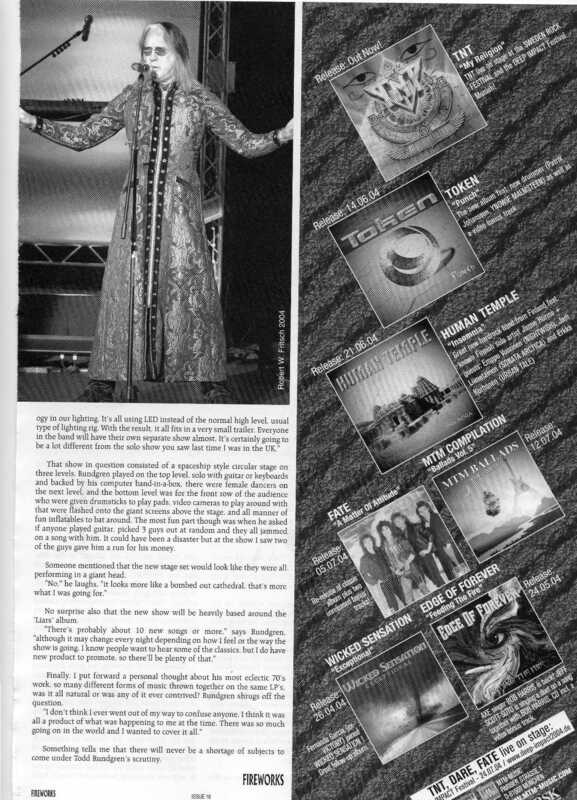 Total Music magazine, a new magazine that is given away free at all Virgin Megastores in the UK, went Todd crazy in their current issue with Alanis Morrissette, citing Liars as one of the best albums of the year, raved on about the TR DVD Box Set from BMG, and even ran a photo of Todd and listed all his July concert dates. 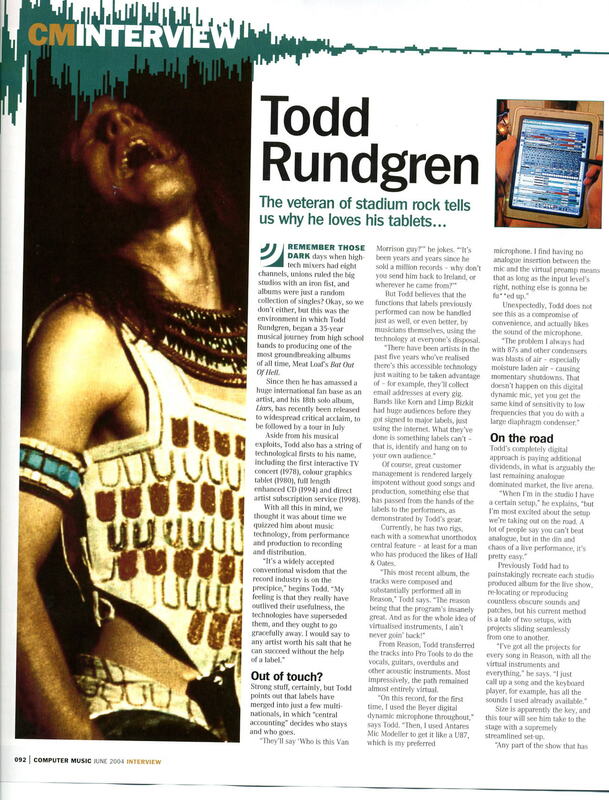 Classic Rock magazine ran a spectacular 8 page deluxe A-Z feauture on Todd in their August 2004 issue. 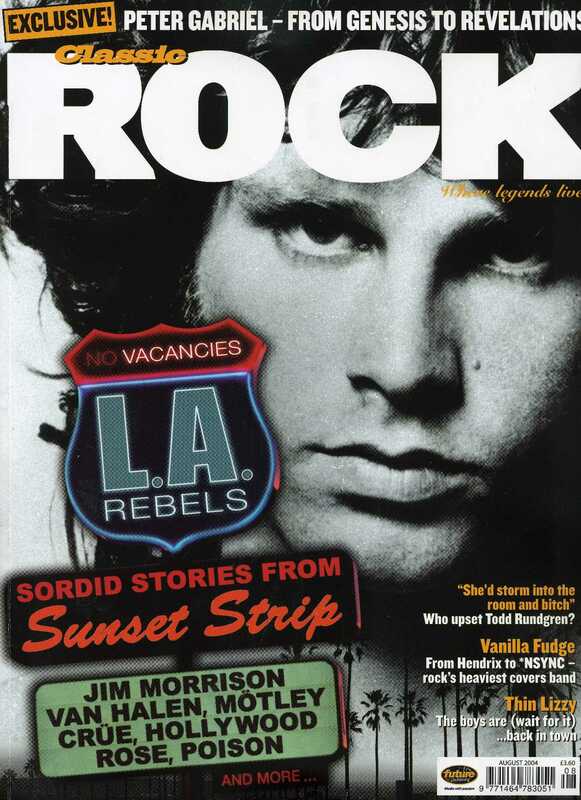 To order the magazine online: http://www.classicrockmagazine.com/. 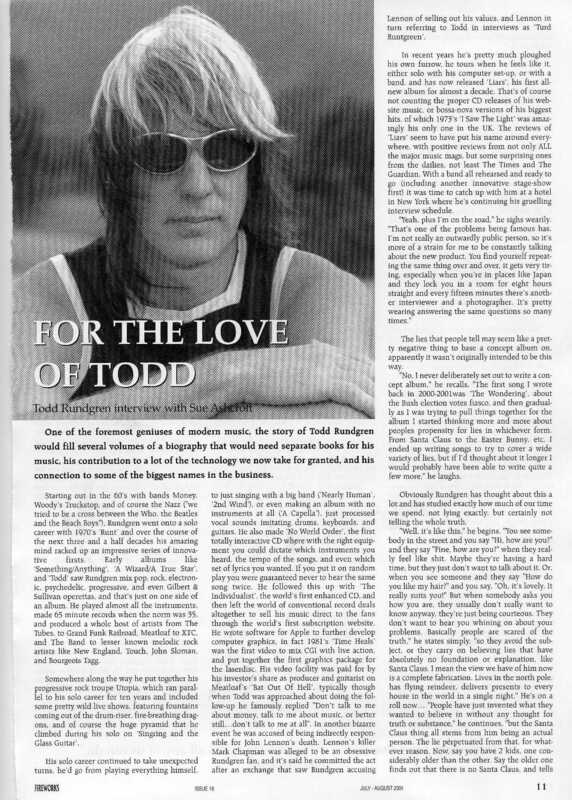 Todd was interviewed an Austin's KGSR on May 25, 2004. 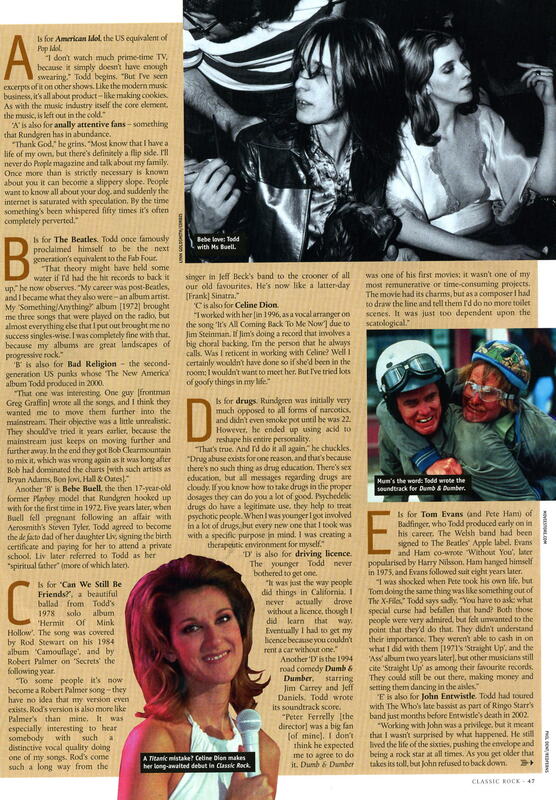 Three parts (1, 2, 3) from the interview are available on their web site. 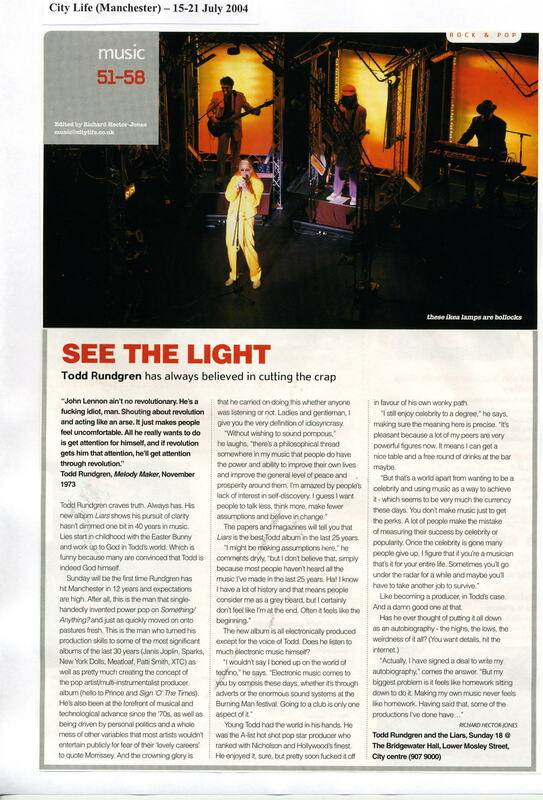 Todd also mentions that the tour will have a couple of Japan dates in October. 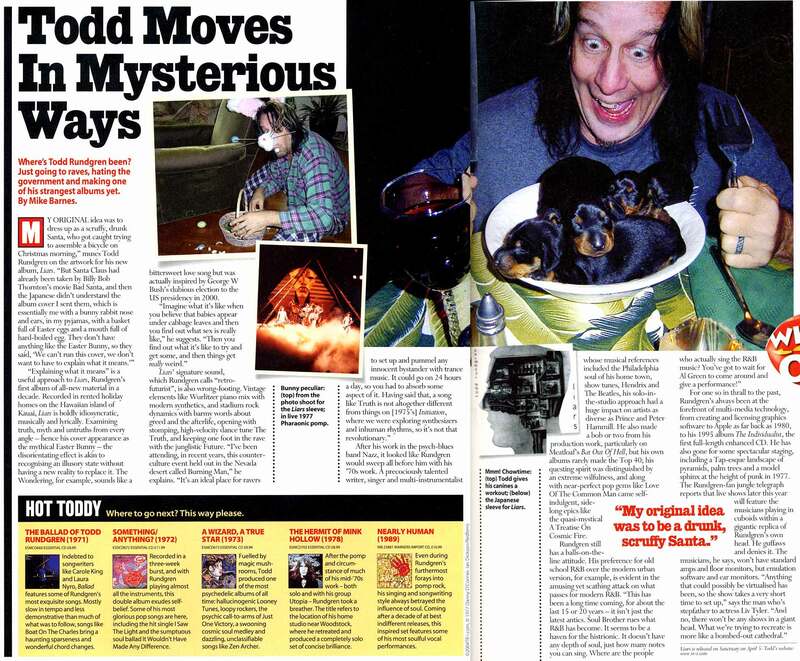 Todd also gushes over the TR Connection in part 3 :) . 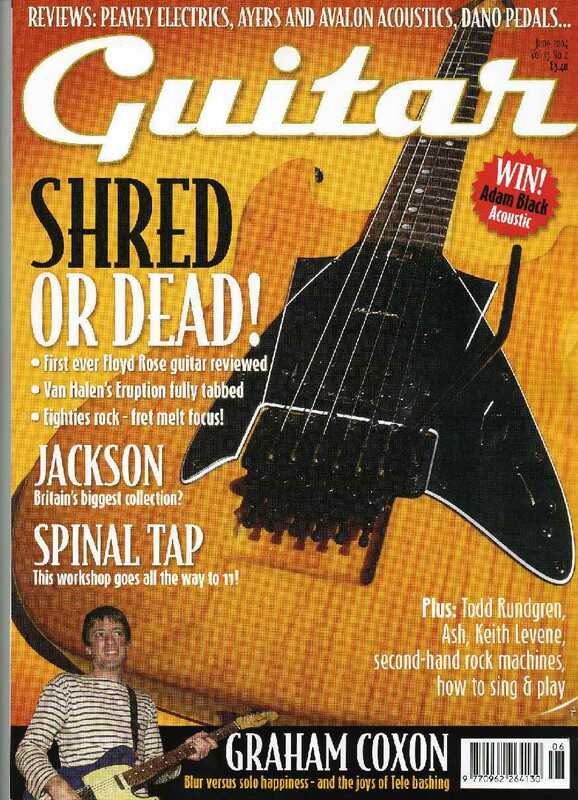 Congratulations to Mike Shell and Jon Sympson, the winners of the contest! The BBC is also running their own contest. 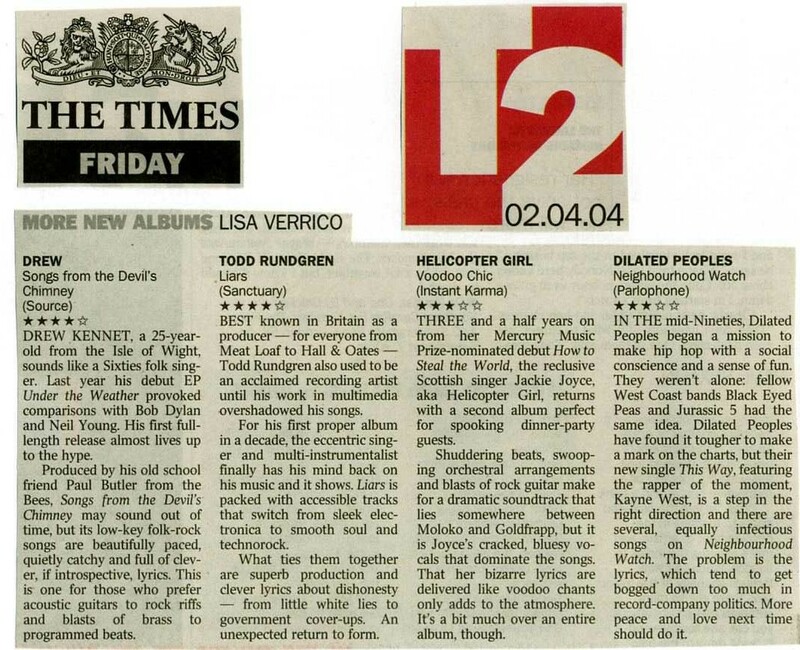 These scans of reviews from the Times, Independent they are a bit large to help with online reading. 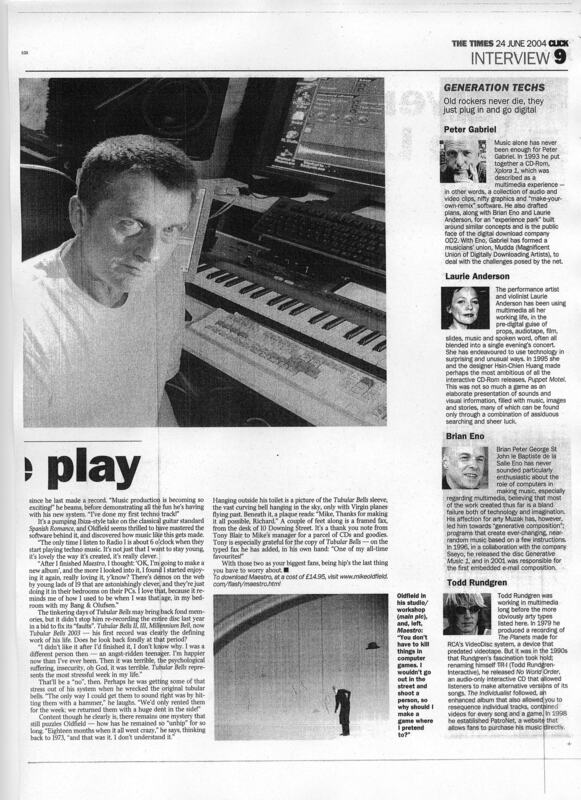 Todd was interviewed live on BBC on the Johnny Walker Show March 31, 2004 at 6:20pm GMT on BBC Radio 2 (England's national radio station). he was online for about 30 minutes. 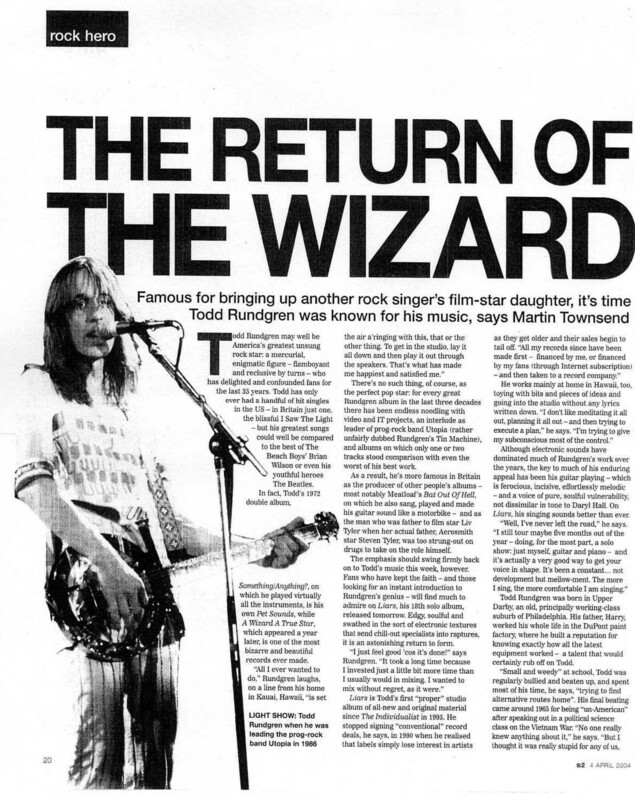 He spoke of the new CD, Nazz, Patronet, and announced the London date on July 15. More European dates will be announced soon. 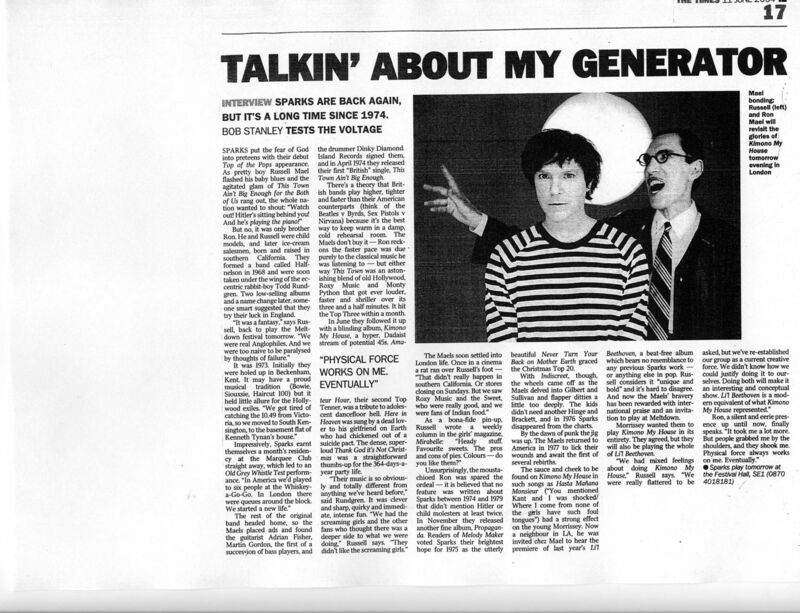 For those of you who never heard the Todd/BBC Radio 2 interview, click on this link and activate the interview online - it is now archived for everyone to listen to! The lyrics are now up for all of "Liars." 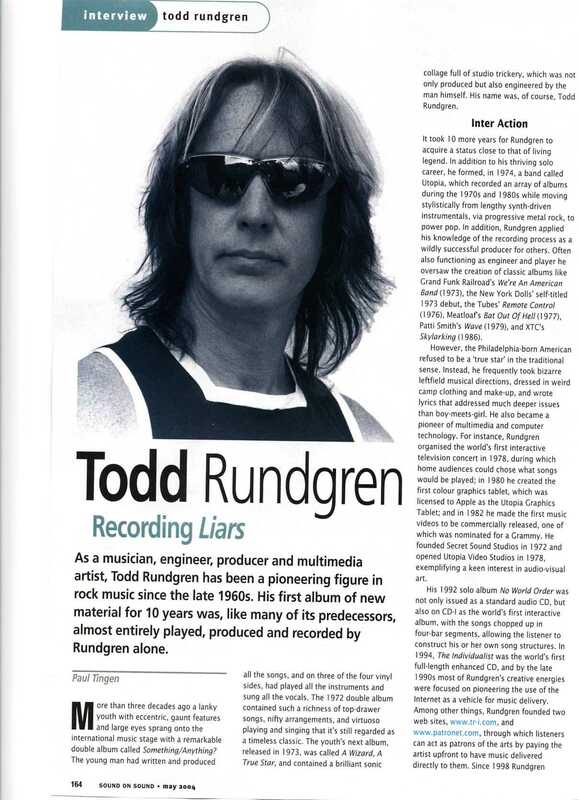 Todd Rundgren and the Liars Tour started April 8th! 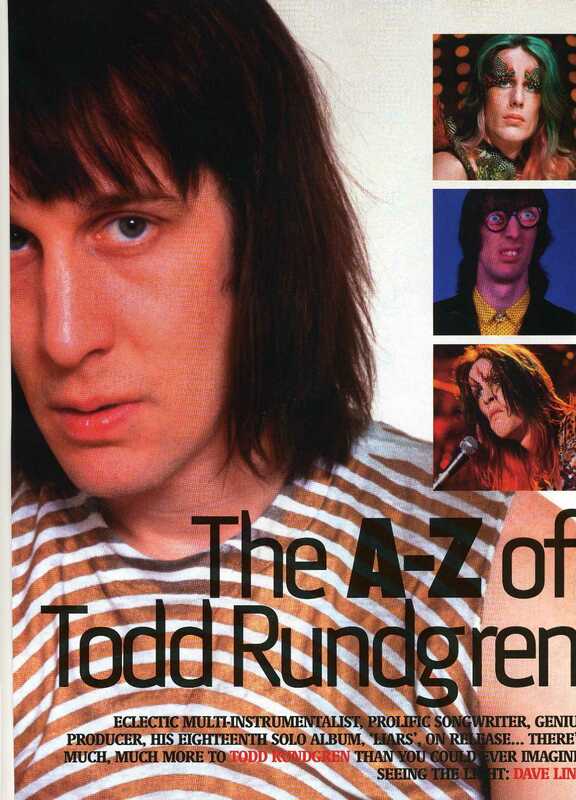 Kennedy Street by arrangement with The Agency Group Limited today announced two new dates to Todd Rundgren and the Liars July 2004 UK European Concert Tour. 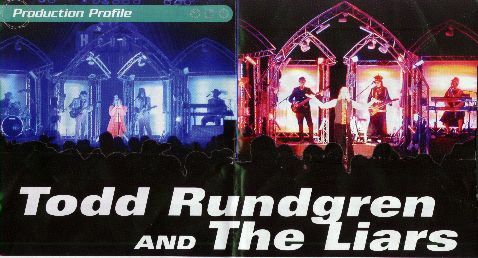 The tour marks Rundgren's first live concerts in Britain in 10 years (since 1994's 'No World Order' tour). 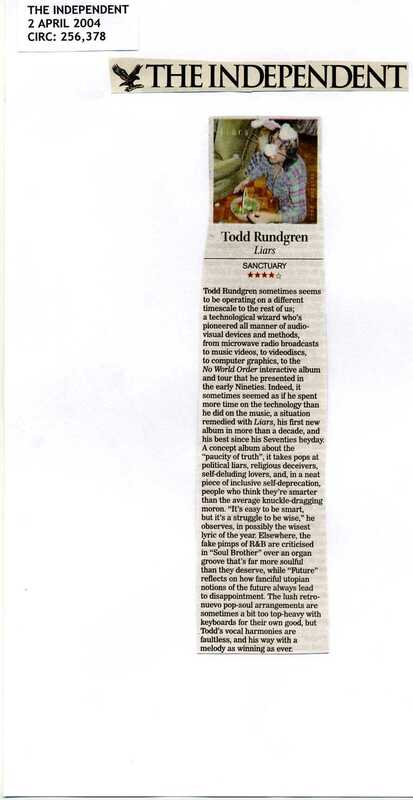 The Australian Financial review gives Liars Ten Stars in its CD review. 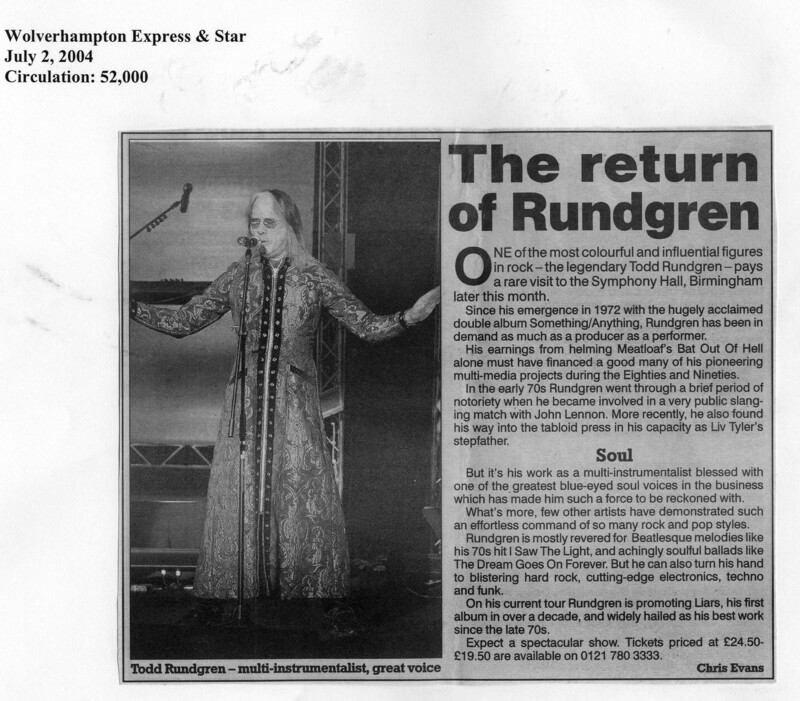 Famed guitarist and producer Todd Rundgren has announced his first U.K.tour for 10 years. And he's going to carry the whole production in a trailer that's hitched to the tour bus. There will be no lorries for the staging or the backline. 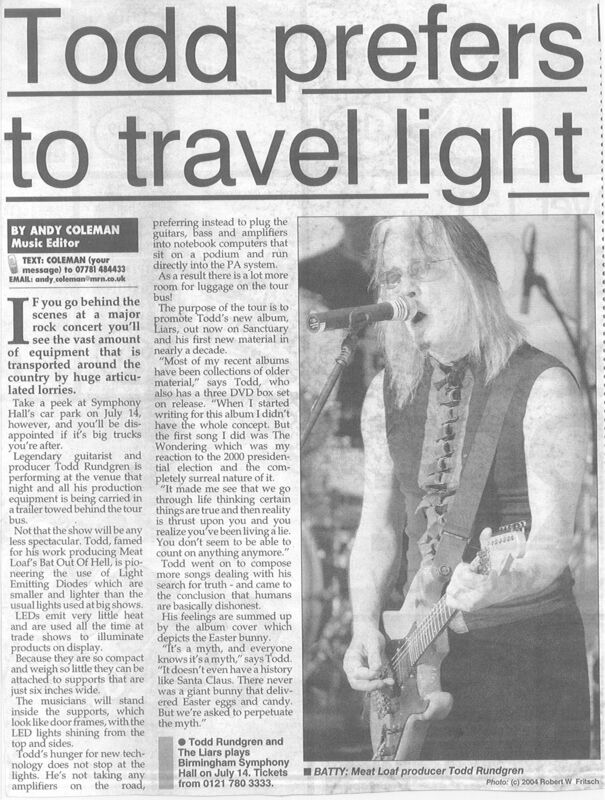 The mobility is a byproduct of Rundgren's use of LED (light emitting diode) lighting, which is believed to be a first for a rock 'n' roll performance. LED lighting is used all the time in trade shows, illuminating products on display. It emits very little heat. Not only this, but because of the compact nature of this technology, the whole production can be carried in a small trailer! 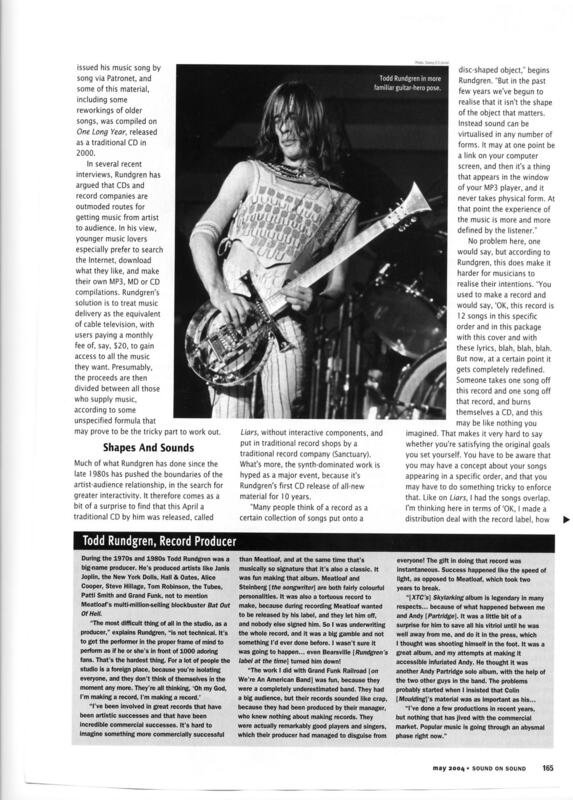 Philadelphia Inquirier "Ever the maverick"
The April 16th issue of Entertainment Weekly on page 79 has a review of Liars by Marc Weingarten, who gives it a disappointing C+ rating and says: "Rundgren has been woodshedding it with high technology for too long. 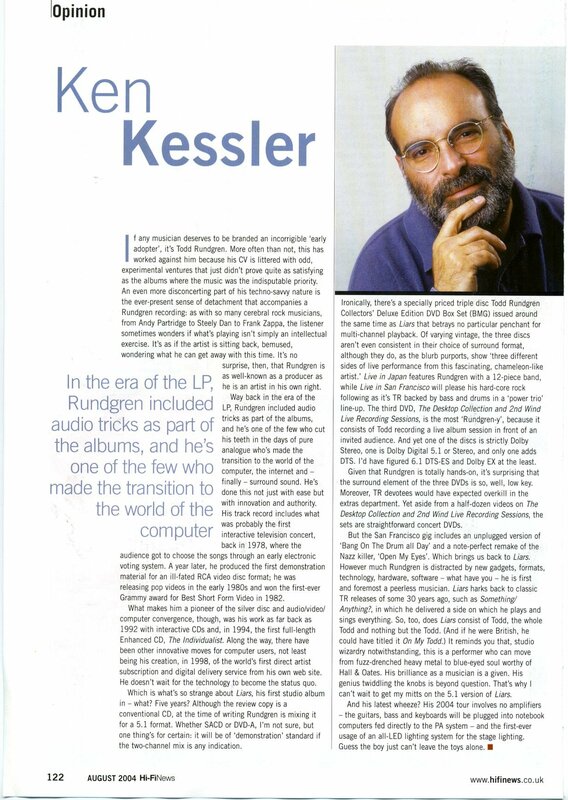 On his latest, a state-of-the-world address (guess what state it's in), he drowns decent melodies in a miasma of digitized keyboards and electronic drum sounds that are as strident as his screeds. 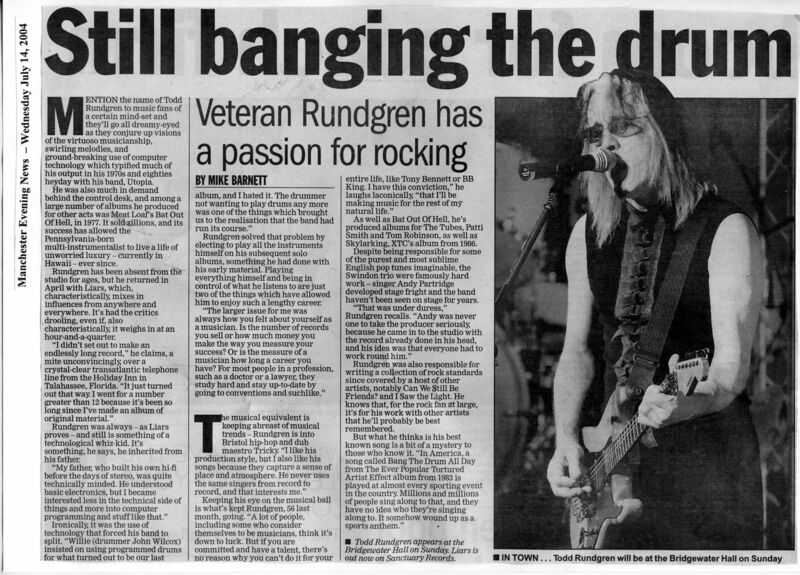 It sounds hermetic, as if Rundgren's a crank who locked himself into his home studio and threw away the key." 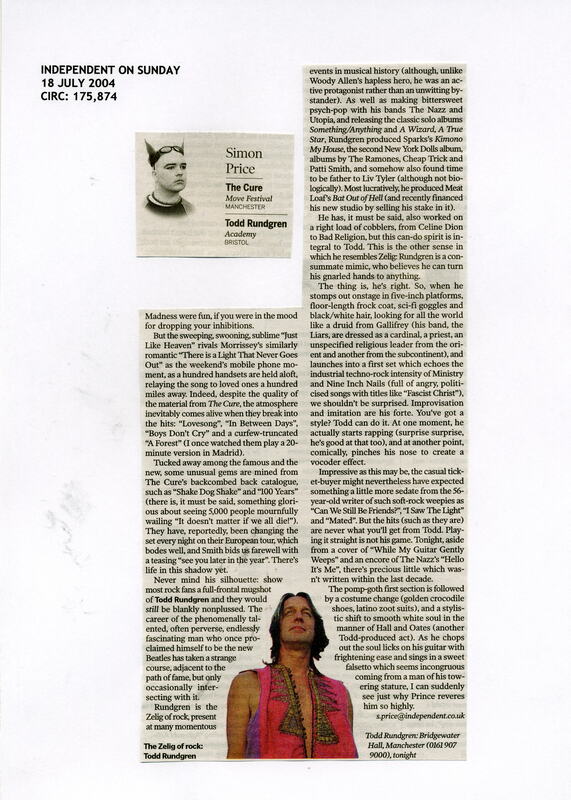 "Ten years since his last release, musical nomad Rundgren returns with a daring record that veers from electronica through to soul and back again. 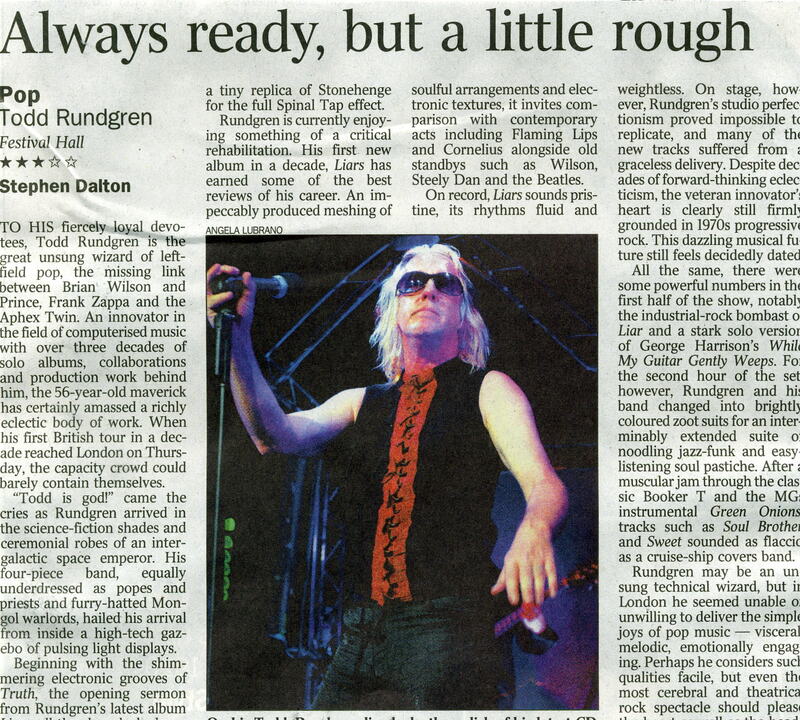 Although such jumping between styles could be annoying, Rundgren's solid songwriting allows him to pull it off." 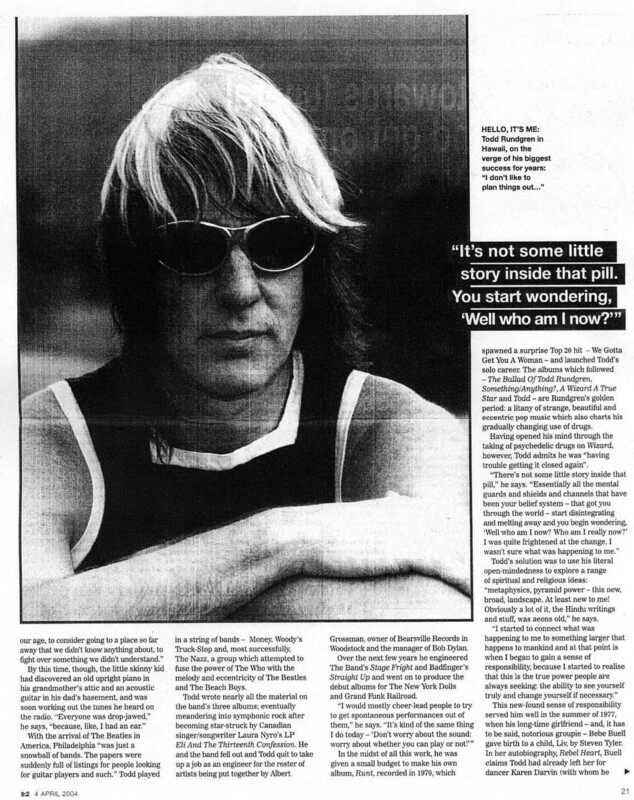 "As with Bowie's career arc, so Todd Rundgren's latest album suggests that songwriters who get a bit lost in their late thirties and forties (often getting sidetracked by shiny new technology and ultimately uninteresting interactive projects) can find a new relevance when they hit their fifties. 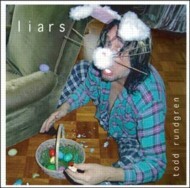 Liars is Rundgren's best album for a long while. It's not perfect. The high-energy opening track is dreary, and his prog-rock tendencies, acceptable on the melodic Stood Up, turn Mammon into portentous sludge. 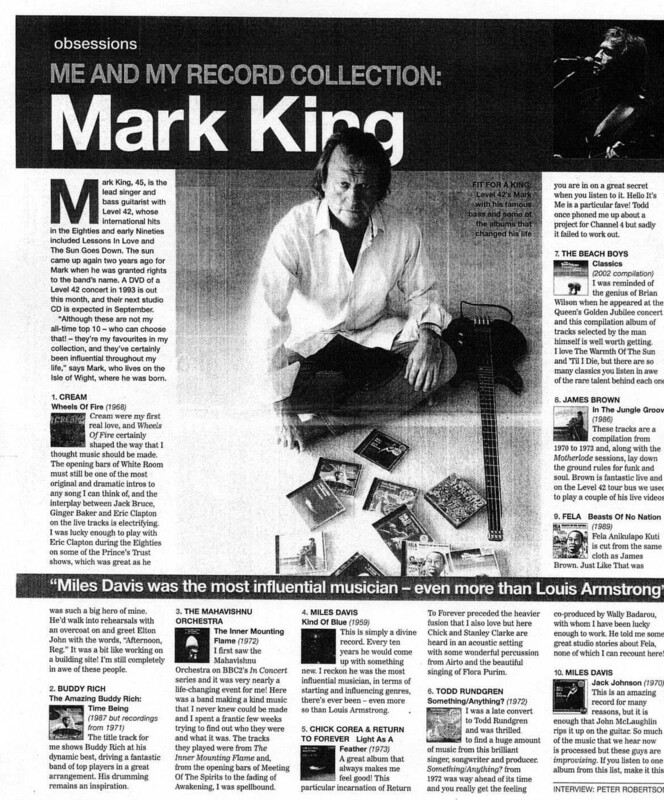 Yet when he veers into drum'n'bass (with a subtlety that eluded Bowie on Earthling), the album picks up. 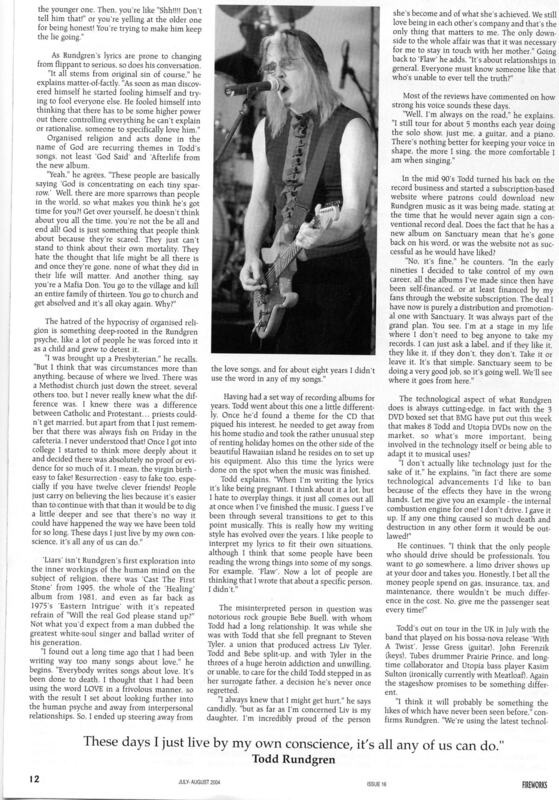 When he returns to his soul-boy stylings on Flaw, Afterlife and, especially, Past, he gets pretty damn close to his sublime early 1970s heyday." 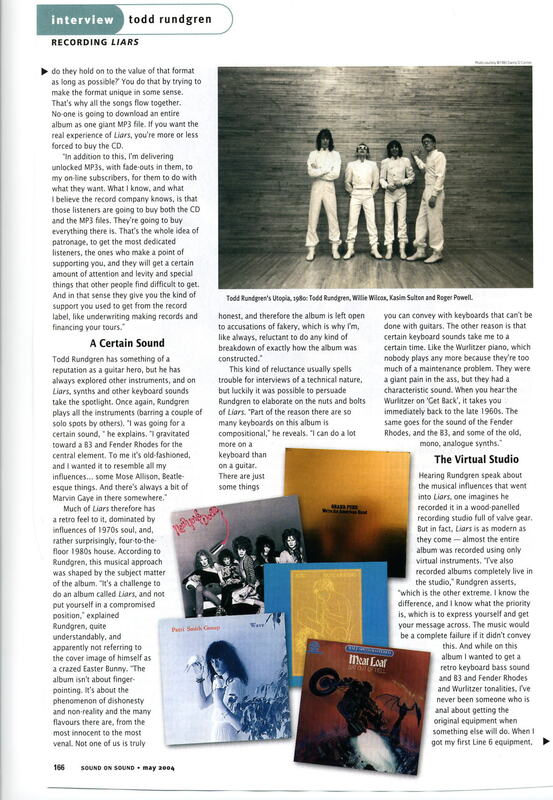 The Music Index Review of Liars and interview. 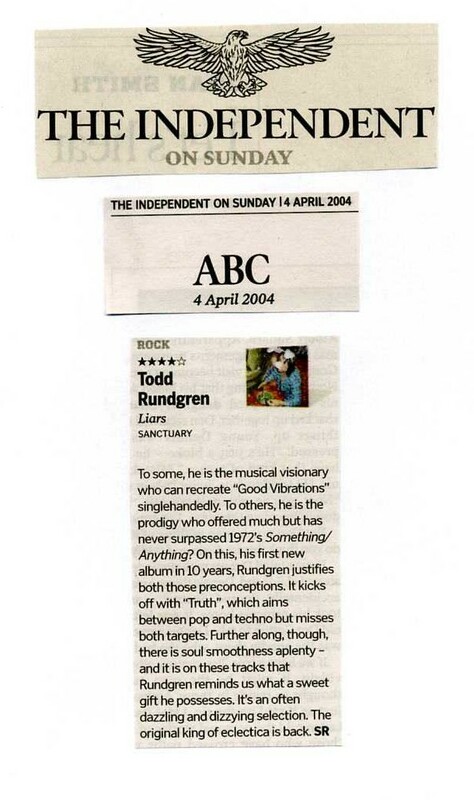 Todd's new CD "Liars" is set for a US release on Sanctuary on April 6, 2004. The UK release will be a day earlier, Monday, April 5. A Japanese release was 3/17/2004. 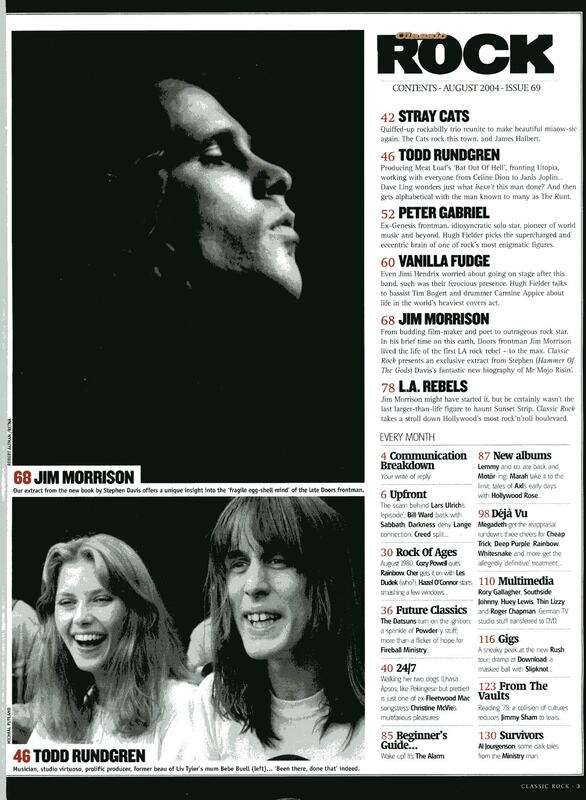 Two tracks, "Happy Anniversary" and "Soul Brother" debuted on Michele Rundgren's radio show on February 13. Didn't hear them? Sorry, must have been Friday the 13th at work. I just heard the new album and it is really phenomenal. 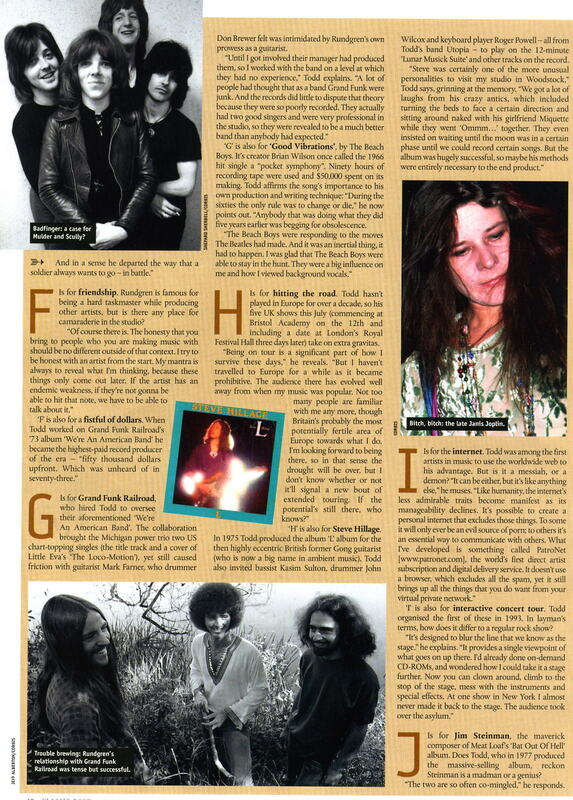 Very spiritual, electronic and is kind of like a full circle to Initiation/Real Man and Todd era. A stunning, powerfully emotional and beautiful piece of work. 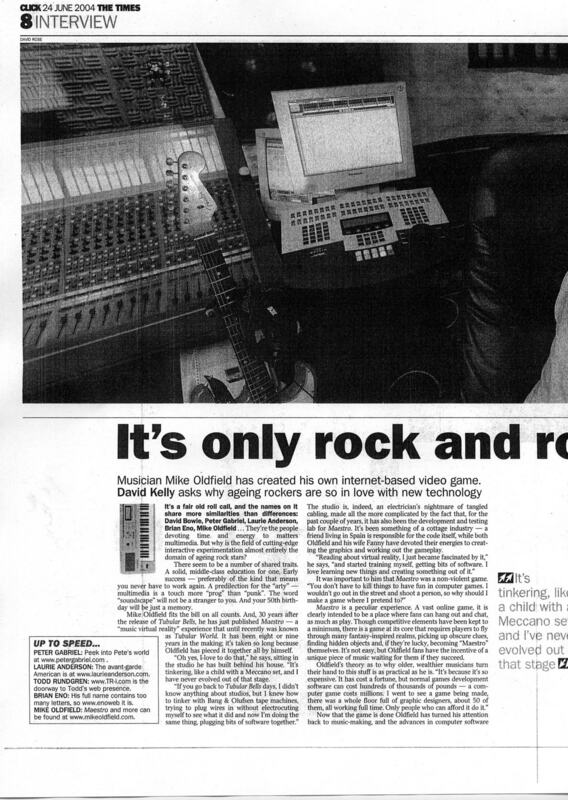 Makes David Bowie's last album seem really lame. Liars is the album everyone has been waiting for and for anyone who felt that One Long Year fell short, Liars will blow their minds. Lyrically, it's a work of art, and the vocals are incredible. 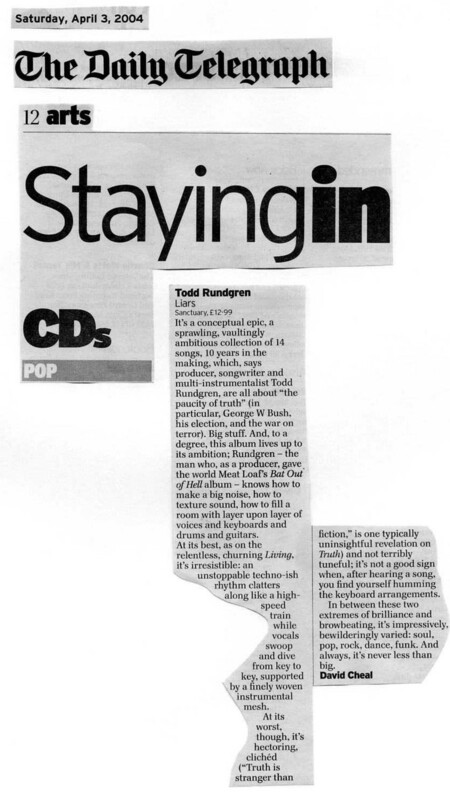 I've only heard it once but once you get halfway through the album, Todd hits you with three killer tracks, and as you progress with the songs, everything suddenly becomes very clear - we're all liars but we're all too afraid to admit it. 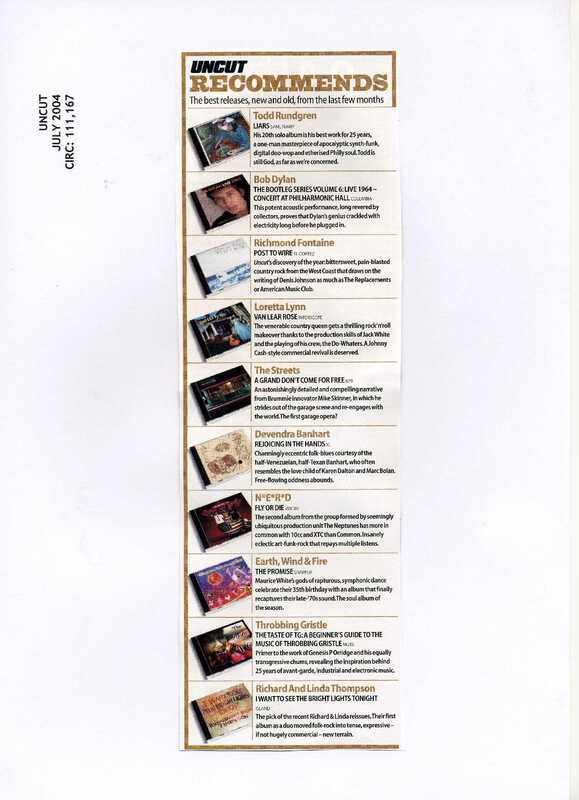 CD Japan also has information in English.